Corner shelves provide home décor with functionality. Our floating corner shelves are a great way to maximize storage space while adding a contemporary look compared to wood shelves. Corner glass wall shelves can be used to complement entertainment centers, built-in wall units, closets, mantles, desks, display cases for collections, bookshelves, dining rooms, office spaces and more. 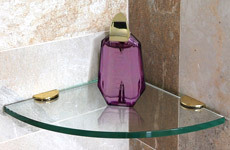 Quarter small shelf units are curved for a sleek contemporary look. Pentagon shaped corner shelves are squared at the edges. Triangle corner shelves provide a sleek geometric design. 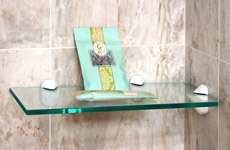 Rectangle corner glass shelves provide a larger, more versatile storage area. Open kitchen wall shelves are an alternative look to typical cabinets for designer kitchens. If you prefer cabinets, upgrade your cabinetry with kitchen cabinet glass shelves. For a minimalist look, use the shelves to show off fine china, stemware or collector's items. In the dining room, add glass bar shelves to compliment your wine and liquor cabinets. If you are taking a functional approach, storage shelving can be used for showcasing your decorative tableware or corner shelves can fill in the gaps between cabinets and other spaces that often go unutilized. Wood shelves become moldy over time and bathroom shelves discolor due to excess moisture. 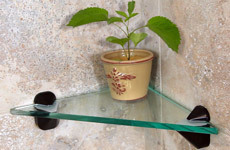 Opt for glass bathroom wall shelves, as they are easy to clean and maintain. 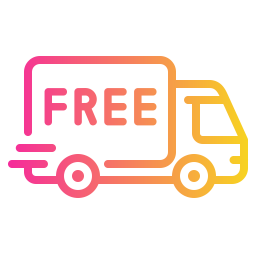 In addition to glass shelves, we offer ready-made shelves so options for shelving units can accommodate many bathroom dimensions. 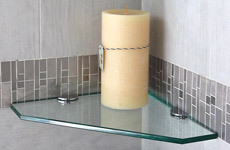 Add extra space to your vanity with a glass shelf or utilize corner space with bathroom glass shelves. View our shelving ideas blog post. Whether you are looking for bathroom wall shelves, kitchen shelving units, or mini shelves, we can personalize your shelves to fit your home's aesthetic. Mix and match shelving systems and adjustable shelf brackets for a personal touch.